Virginia sweetspire is a deciduous to semievergreen shrub native to eastern North America from New Jersey and Missouri south to Florida and Louisiana where it grows on stream and pond margins, swamps, and low woods. It is a member of the Iteaceae family, a small group containing two genera and eighteen species. The arching branches form a spreading shrub with lustrous oval leaves up to four inches long that are serrated and mid- to dark green until fall when they turn gold, orange, and red and purple, persisting well into early winter. 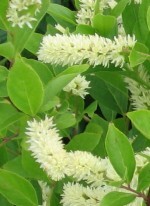 In late spring to early summer fragrant white flowers appear in pendulous cylindrical racemes three to six inches long. The plants are tolerant of different light and soil conditions and are a good choice for a specimen, shrub border, and ground cover as well as along stream borders, on slopes, and included in a rain garden or woodland garden. The cultivar ‘Henry’s Garnet’ is more widely available than the species and boasts more compact form, larger more showy flowers, and better fall coloration. The generic name, Itea, comes from the Greek word meaning willow and refers to the willow-like leaves. The specific epithet, virginica, means of Virginia. Care: Control horizontal spread if desired.